HRC has completed an extensive study for three districts in Tegucigalpa, Honduras for evaluating concerns with urban flash flooding. The project was a subaward agreement from GOAL Honduras and funded by the U.S. Agency for International Development/Office of U.S. Foreign Disaster Assistance. The regions are characterized by steep terrain, significant urbanization and high rainfall rates. 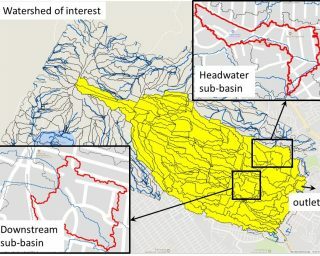 The goal of the study was to tailor numerical modeling tools for the region to simulate the flooding conditions in the districts with high resolution for design storms of a given return period. In addition, the study aimed to develop numerical methods for incorporating flood mitigation measures such as increased channel roughness due to revegetation, the construction of gabion dams and delineating detention basins for extra water storage during flood events. Results of application were also reported for severe events. 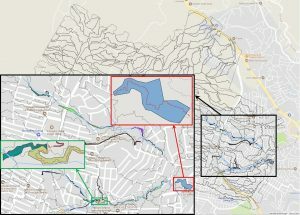 The executable software was presented, used and delivered to the participating agencies (e.g., GOAL Honduras, Comision Permanente de Contingencias Honduras (COPECO), Alcaldía Municipal del Distrito Central Tegucigalpa, and Universities) to develop cost-feasible flood mitigation measure scenarios for the study area at a hands-on training workshop in Tegucigalpa.